Our MERV 12 pleated AC and Furnace filters utilize 100% synthetic media which offers significantly higher particulate efficiency than regular poly/cotton media pleated filters, with little change in static pressure. 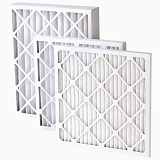 These filters capture airborne particles/allergens as small as 0.3-1.0 microns in size, such as particles that may carry viruses and bacteria, pollen, dust mites, smoke particles, mold spores, fine dust, auto emissions and pet dander. BestFilters MERV 12 filter media will not promote the growth of bacteria, mold, mildew, or fungi in normal operating environments, and have not been chemically treated. These MERV 12 pleated filters are an ideal upgrade from standard disposable panel filters. Our air conditioner furnace filters do not allow the growth of mold or bacteria, keeping your home healthier. No harsh chemicals are necessary to make the air conditioner furnace filter "antibacterial". Our air conditioner furnace filters use permanently charged electrostatic material that helps dust cling to the air conditioner furnace filter.